Klei Entertainment's upcoming Xbox Live title Shank is receiving a bit of extra love in the form of God of War writer Marianne Krawczyk. Shank is an indie side-scrolling brawler that recently caught EA's eye, ending in a publishing deal between the two companies. With that kind of support, Shank seemed poised for success, but EA and Klei weren't going to stop there. The companies announced today that they have brought acclaimed God of War writer Marianne Krawczyk into the fold. Krawczyk, who is the recipient of the British Academy of Film and Television Video Game award for Best Story and Character, said she is working to craft "a story that will allow gamers to explore a world where values like integrity and loyalty take on their own twisted meanings." 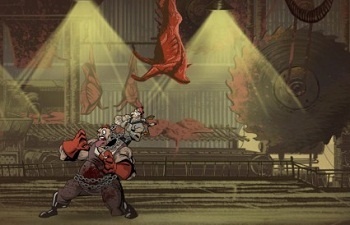 For Shank's narrative, Klei CEO Jamie Chang said it is important to emphasize its cinematic style. With the theme of revenge taking the fore, the story is shaping up to be one with which Krawczyk has a lot of experience. Still, Shank's style draws far different inspiration from God of War, hearkening back to the "golden age of comics and graphic novels," so it will be interesting to see what she will do with a new atmosphere and cast. Currently, Shank has no listed release date.